Summer is here and so is the warm weather. The perfect time to indulge in a heaping bowl of cold, sweet ice cream. But if dietary restrictions keep you from diving into dairy-loaded sweets than vegan ice cream is something you need to discover. 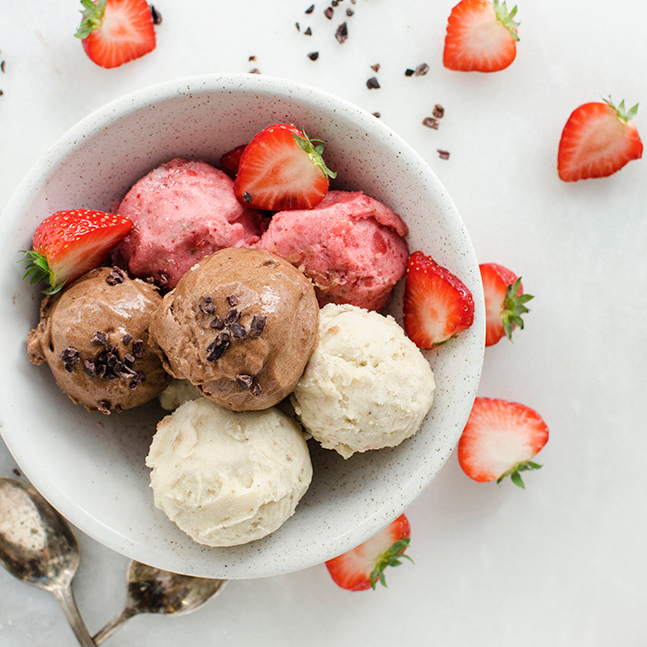 Renowned food bloggers Virpi Mikkonen and Tuulia Talvio paired up and created some of the most delicious ice cream treats that are dairy-free, gluten-free and refined sugar-free with their new cookbook N'Ice Cream: 80+ Recipes for Healthy Homemade Vegan Ice Creams. These all natural, wholesome recipes will allow you to "eat goodies without feeling crappy afterwards". Here are our favorite, easy to make vegan ice cream recipes. 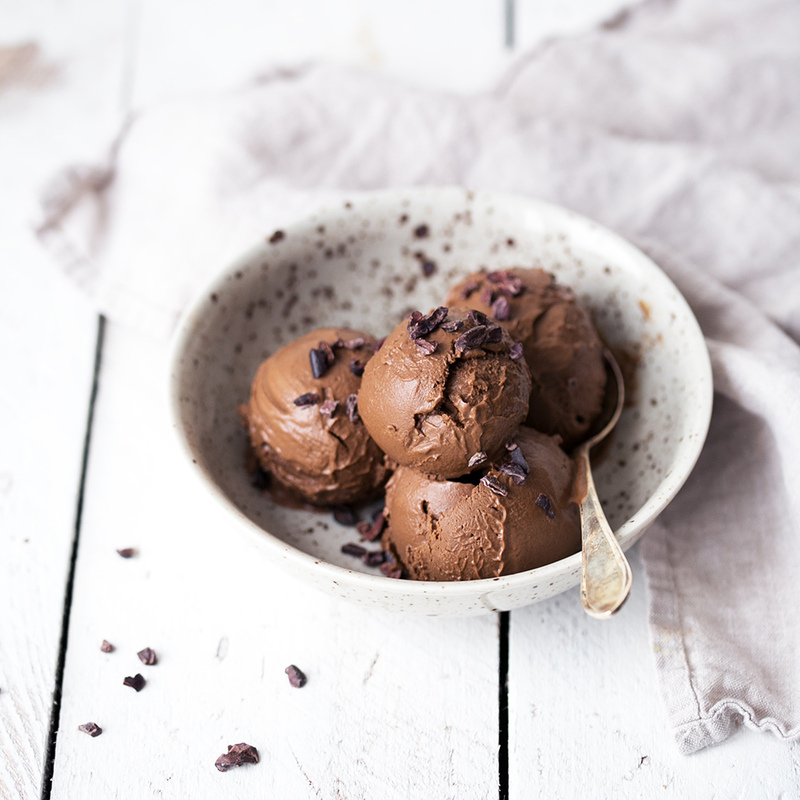 Just add a few spoonfuls of cacao and get a rich creamy chocolate ice cream. Bravo, avocado! Add all ingredients into a blender and blend until smooth. Taste, and add sweetener or more cacao if desired. Pour the mixture into your ice cream maker and prepare the ice cream according to the manufacturer’s instructions. Serve straight away or transfer to a freezer-safe container, cover and freeze until ready to be served. Let the ice cream thaw for 10-15 minutes before serving. Pour the ice cream mixture into a freezer-safe bowl and freeze for about three hours, mixing well every 30 minutes. After three hours, scoop into bowls, serve and enjoy! 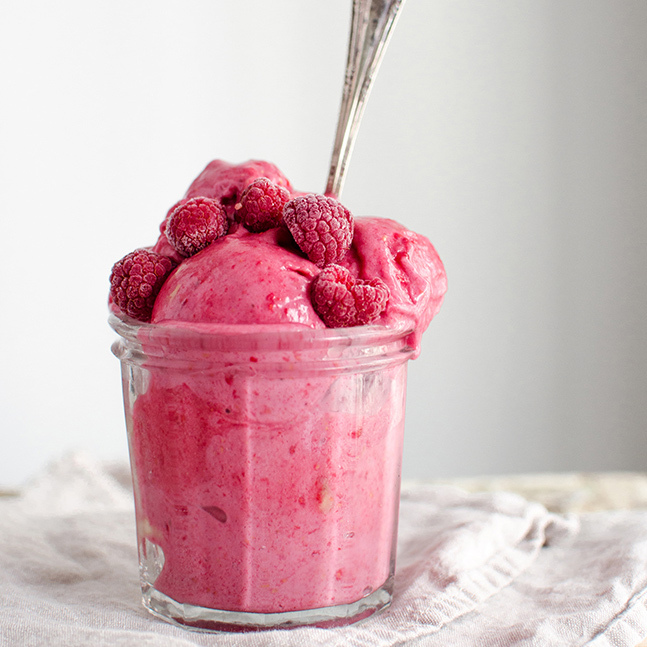 This pink berry delight is super easy, fresh, and so creamy. The recipe works perfectly with other berries and fruits as well! Combine the banana, raspberries, almond butter, and syrup in a blender and blend to a smooth and creamy texture, scraping down the sides of the blender a few times if necessary. Add the almond milk, if needed, to achieve the desired texture. Scoop into a bowl, serve and enjoy! For a quick and easy ice cream, just throw some frozen bananas into a blender, whip them up, and enjoy. Don’t be afraid of the black spots on overripe bananas-- just peel ‘em, chop ‘em, toss ‘em in the freezer, and wait for ice cream craving to strike! Combine the bananas (and other fruit) in a blender and pulse until smooth, scraping down the sides of the blender as necessary. If the mixture is too thick, add the almond milk to achieve the desired consistency. Add flavoring and sweetener, if using, and blend until combined. Scoop into a bowl, serve, and enjoy! Need a mint fix but don’t want to wait too long? This beauty is ready in minutes! Open the coconut milk can and scoop the thick white cream into a blender. 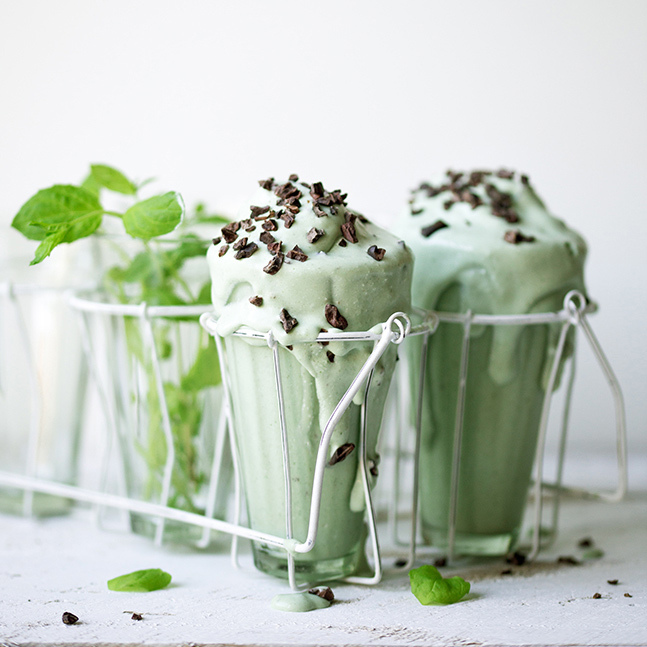 Add the bananas, spirulina, if using, maple syrup, fresh mint and peppermint extract to the blender and blend until smooth, scraping down the sides of the blender if necessary. Taste and add more sweetener or mint, if desired. Add about two thirds of the raw cacao nibs and stir gently with a spoon. Scoop into bowls, sprinkle the remaining raw cacao nibs generously on top, and enjoy! Cinnamon buns are like a big warm hug from the inside. There is no better comfort food than this ice cream when you are in need of some extra care and tenderness. Combine the almonds, pecans, cinnamon and cardamom into a blender and blend until they form a fine crust. Add 1 date and blend until the mixture is still dry but just beginning to form clumps. Scoop half the mixture into a bowl and set aside. Add the remaining dates and the water to the blender and blend to a smooth paste. Scoop the cinnamon paste into a second bowl and set aside. Wash and dry the blender. Combine the frozen bananas, coconut milk, and vanilla in the blender and blend until smooth. Scoop the ice cream into a bowl. Stir in some of the cinnamon paste. 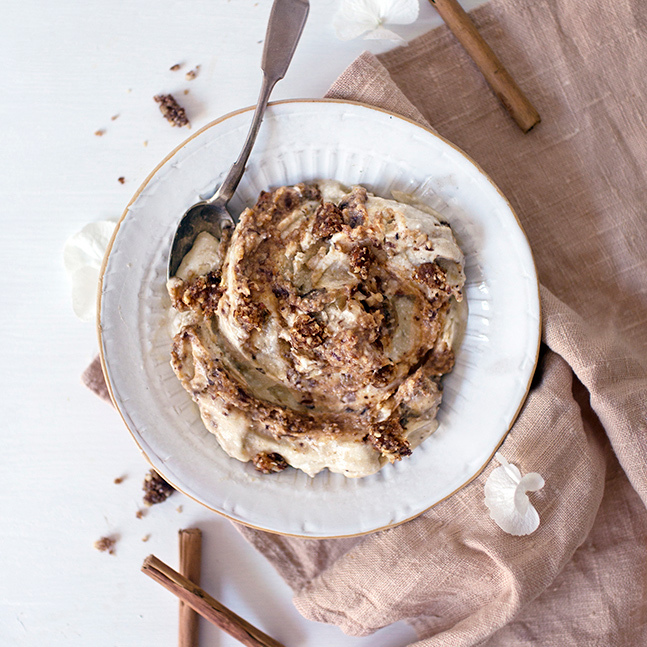 Divide the ice cream between serving bowl and top with chunks of the flaky cinnamon crumbs. Serve and enjoy! These creamy, dreamy strawberry pops have a hint of basil for a nice surprise. You can also turn this recipe into a lovely milkshake! Just use cold ingredients and add some ice when you blend. Place all the ingredients in a blender and blend until smooth. Taste and add more basil or sweetener, if desired. Pour into ice cream molds, add ice cream sticks and freeze for 4-6 hours until firm. Remove the molds by dipping them into hot water for a moment. Serve and enjoy! 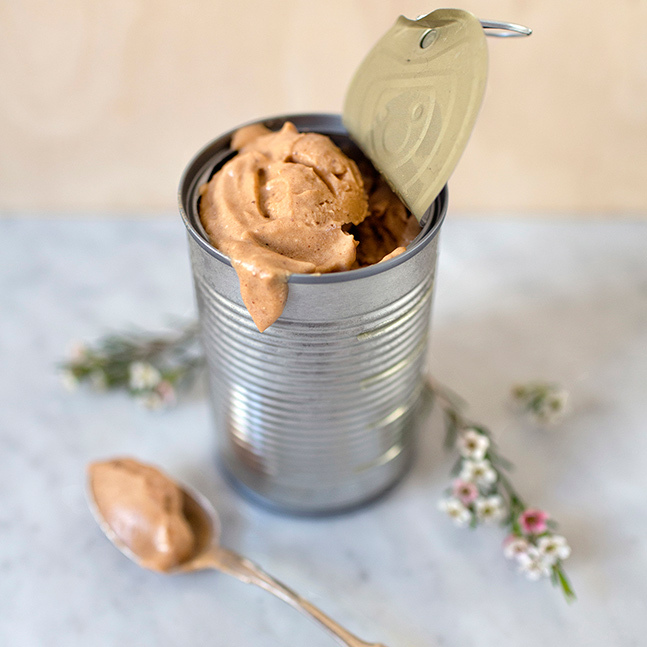 It may sound odd, but sweet potato serves as a terrific base for ice cream. We love to combine it with warm notes of gingerbread spice for an autumnal flair-- but sweet potato would also work as a base for rich chocolate ice creams. Combine all ingredients in a blender and blend until smooth. Enjoy as a soft serve or freeze for one to two hours before serving. 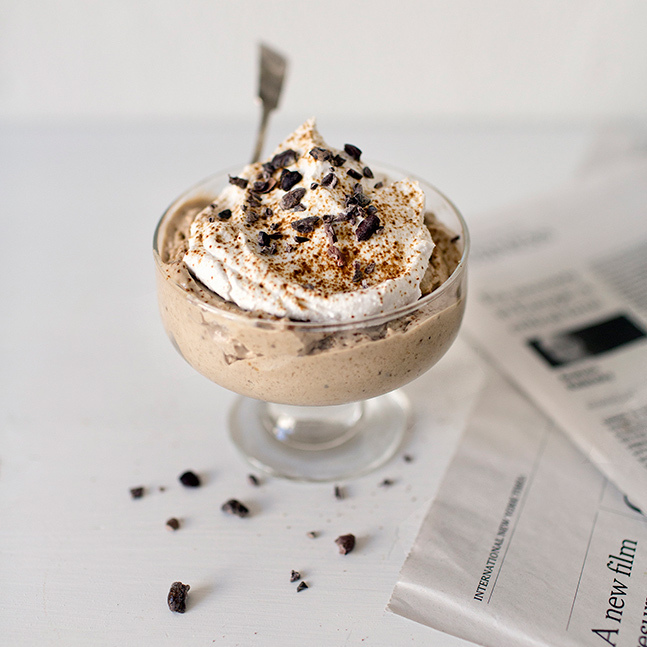 Even if you’re not a coffee drinker, you really should try this heavenly coffee sundae. The creamy, rich taste is out of this world. Place the cashews into a blender and blend until they form a fine crust. Add almond milk and blend until smooth. Add frozen bananas, almond butter and instant coffee and blend until smooth. Scoop into serving bowls, top with Coconut Whipped Cream (if using), sprinkle with some instant coffee and cacao nibs, serve and enjoy! 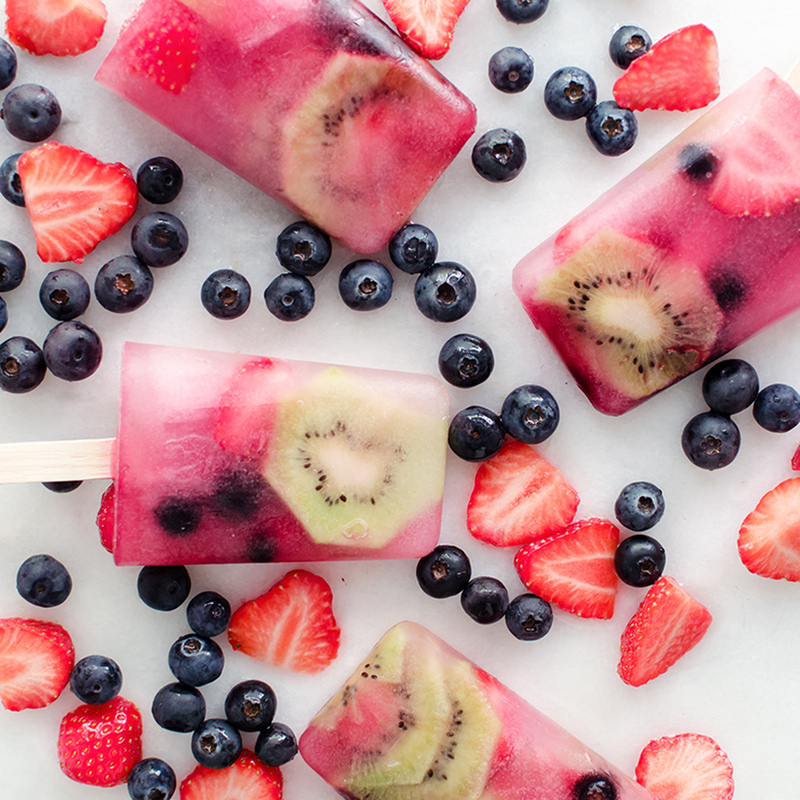 When you need to cool down, make this simple and super refreshing combo with coconut water, fruits and berries! Combine the kiwi and the berries in a bowl. Divide the berry mixture among six ice pop molds and fill the molds with coconut water. Add ice pop sticks and freeze for 4-6 hours, until firm. Remove the molds by dipping them into hot water for a moment. Serve and enjoy!